US President Barack Obama has voiced his disappointment directly to UK PM Gordon Brown over the release of the Lockerbie bomber, the White House says. It says Mr Obama made his remarks in a telephone call to Mr Brown. The decision to release Abdelbaset Ali al-Megrahi was taken by the Scottish government, and the British government insists it did not intervene at all. Megrahi was jailed for the 1988 attack which claimed 270 lives. He was freed on compassionate grounds last month. He then returned to his native Libya, where he was given a hero's welcome. "The president expressed his disappointment over the Scottish Executive's decision to release convicted Pan Am 103 Bomber al-Megrahi back to Libya," White House spokesman Robert Gibbs said in a statement. Downing Street confirmed that the issue was raised during Mr Brown's 40-minute telephone conversation with Mr Obama on Thursday. A spokesman in London said the issue "came up" but refused to say who raised it first. The spokesman also declined to confirm if Mr Obama had expressed his disappointment over the release of Megrahi, who has terminal prostate cancer. Mr Brown had made it clear the decision had been a matter for the Scottish government, the spokesman added. 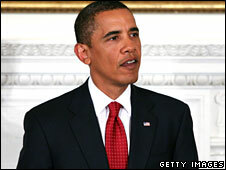 Last month, Mr Obama said the release of the bomber was "a mistake", but had not expressed this personally to Mr Brown. It is notable that Mr Obama decided to make the point directly to Gordon Brown, the BBC's Adam Brookes in Washington reports. The US government feels that its position on Megrahi's release was ignored and it has also had to respond to absolute fury on the part of many of the families of the American victims of the Lockerbie bombings, our correspondent says. 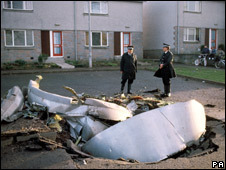 He adds that although there is so much else going on in the US-UK relationship at the moment, the Lockerbie story is an irritant but it does not seem to engender any serious transatlantic rift. Nearly 200 Americans were among those who died in the explosion. Megrahi's release has also been criticised by opposition parties in both Edinburgh and London. Mr Brown insists there was no "cover-up or conspiracy" over the release and says commercial links between UK and Libya, which have burgeoned since 2004, did not affect the decision. But the prime minister has refused to be drawn on whether he supported the Scottish government's decision.